The perfect chapter book biography for young fans of the Hamilton musical! Most people know that Alexander Hamilton was killed in a duel with Aaron Burr, and that his face is on the ten dollar bill. But he was much more than that! Born in the West Indies, Hamilton arrived in New York as an immigrant, an outsider. He fought in the American Revolution and became George Washington's most valuable aide-de-camp. As one of America's Founding Fathers, he was there for the writing of the Constitution and became the first Secretary of the Treasury. 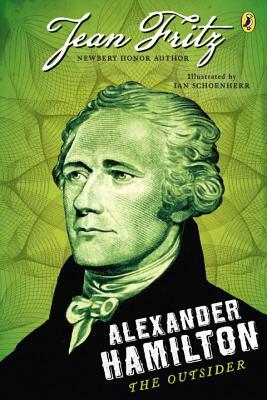 Jean Fritz's award-winning talent for bringing history to life shines as she shares the true story of Alexander Hamilton, a man of action who was honorable, ambitious, and fiercely loyal to his adopted country. Acclaimed biographer, Jean Fritz, was born in China to American missionaries on November 16, 1915. Living there until she was almost thirteen sparked a lifelong interest in American history. She wrote about her childhood in China in Homesick, My Own Story, a Newbery Honor Book and winner of the National Book Award. Ms. Fritz was the author of forty-five books for children and young people. Many center on historical American figures, gaining her a reputation as the premier author of biographies for children and young people. Among the other prestigious awards Ms. Fritz has garnered are: the National Humanities Medal, the Laura Ingalls Wilder Award, the May Hill Arbuthnot Lecture Award. the Christopher Award, the Boston Globe-Horn Book Non-Fiction Award, a New York Times Notable Book of the Year, and many ALA Notable Books of the Year, School Library Journal Best Books of the Year, and ALA Booklist Editors’ Choice Awards. She passed away on May 14, 2017.